M&M's Pretzel 32.3g - crunchy, salty-sweet M&M famous chocolate balls with a sugar colorful coating. Milk chocolate (sugar, chocolate, skim milk, cocoa butter, lactose, milkfat, soy lecithin, salt, artificial flavors), pretzel [enriched mononitrate (wheat flour, niacin, reduced iron, thiamine mononitrate, riboflavin, folic acid), food starch-modified, salt, vegetable oil (canola oil and/or soybean oil), corn syrup, malt extract, leavening (contains yeast, sodium bicarbonate and/or ammonium bicarbonate)], sugar, less than 2% - cornstarch, corn syrup, gum acacia, dextrin, salt, coloring (includes blue 1 lake, red 40, yellow 6, yellow 5, blue 1, blue 2, red 40 lake, yellow 6 lake, yellow 5 lake, blue 2 lake). Contains wheat, milk and soy. May contain peanuts. 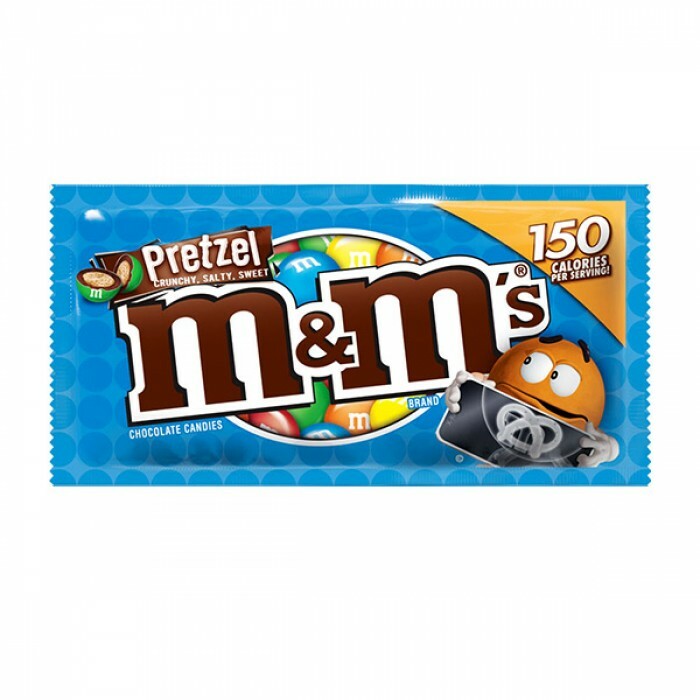 M&M's Peanut Butter 46g - M&M's famous chocolate balls , made with real peanut butter.Ing..
M&M's White Chcolate 42g - M&M's famous chocolate candies in a new version - white chocol..